With you products you define fashion; our labels can help you do it with passion. We offer a wide variety of garment labels, which are developed keeping in mind the most intricate details given to us by our valued clients. 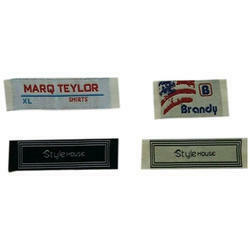 We make sure that these garment labels are manufactured using high quality material. These garment labels find extensive usage in the fashion and garment industries. We offer the facility of adding names and logos on the label. Heat transfer labels appear to be a part of the product. A lot of fashion brands provide a soft touch tag free label on the inside of a garment whereas, some use it on the outside of a garment and take its advantage as it provides a walking advertising board for the brand. A wide array of effects can be invoked by the use of weave textures. These often complement the fabrics used in the garment, for example, Herringbone Twills, Gross Grain and ribbed effects. Others may be graphic such as Marble or floral effects.